The ability to deliver multi-media communications on a variety of compliance topics directly to employees' and third-party agents' desktops or mobile devices in a way that is high-impact, low-bandwidth, non-intrusive, and interactive. The ability to track all of that activity – including interactions with recipients – all in one place and report on it as well. 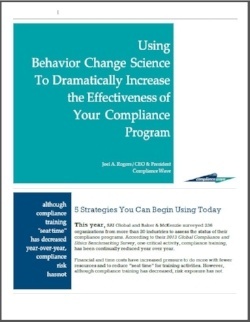 The introduction of proven behavior changing methodologies that will help prevent compliance issues before they occur by impacting how employees think and act.